Papaya Seeds for Parasite Cleanse: How Many & How to Use? Home > Food Facts > Papaya Seeds for Parasites Removal: How Many & How to Use? A home remedy, with naturally occurring ingredients, seems available, but more evidence is required to prove its usefulness for parasite removal. It is the delicious tropical fruit papaya. Normally, when eating a papaya, we throw away the seeds. But can you eat papaya seeds for parasites’ removal? If you worry that the bloating and frequent fatigue, as well as diarrhea, that you suffer from is a result of a worm or parasite in your intestine, you must read further. Yes, papaya and the black seeds inside it, which look somewhat like caviar, could be the remedy that no doctor may have ever told you. Your naturopath may have an idea of this, but if you never mentioned anything about parasites, this was perhaps never discussed. The seeds of the Carica papaya fruit have proven antihelmintic and anti-amoebic properties. A study conducted by Obafemi Awolowo University’s Department of Paediatrics and Child Health in Nigeria on a batch of 60 children with known existence of intestinal parasites showed the effectiveness of papaya seeds to remove parasites. A random group of 30 children was administered a mixture of air-dried papaya seeds and honey (20 ml daily) for seven days; the other 30 children were given a honey-plus-water placebo. Seven days later, the report showed more than 70% reduction in the parasitic existence in the stool samples of those children who consumed the papaya seeds and honey mixture, while the other children showed almost no change in their reports. The report mentioned, however, that the children receiving the papaya seeds and honey mixture also needed to take a laxative to wash or flush out the parasites that the antihelminthic and anti-amoebic activity of the papaya seeds treated. This treatment of papaya seeds and honey for parasites seems to offer a great natural option to deal with this common ailment, although more evidence and research is required to prove this. Now that we know the seeds could be a good parasite killer, how do we use them? It is definitely not a good idea to pick up and chew a handful. The taste would be so bitter that you would blame us for spoiling your mood and leaving a bitter taste in the mouth. Scoop out a tablespoon of seeds from a freshly cut papaya and add them to a good-quality blender. Now, add about a cup of sliced papaya to the blender. If you like, also add a cup of pineapple slices to this. Do not throw away the pineapple core as it is the main source of digestive enzymes that also have an anti-parasitic effect. The core also has a lot of fiber and will aid in cleaning the intestinal tract quickly. Blend it all up with a cup of coconut milk or almond milk. The coconut is also known to be a good parasite remover and would increase the remedy’s effectiveness overall. If you like the taste of spices in your smoothie, add around half a dozen fresh cloves. Make sure they are added along with the papaya seeds so that the blades of the blender grind them pretty well. The fresh cloves give the parasite eggs a hard time and help flush those out too along with the parasites. Once all of these ingredients are added into the blender, blend them into a smoothie as per the consistency that you prefer. If it’s too thick, just add some water and blend it again. Have it first thing in the morning before eating anything else. Finish it in one go so that it is most effective. Follow it up with a laxative so that the parasites are flushed out within a few hours. When Should Papaya Seeds Be Consumed for a Parasite Cleanse? The best time to have this treatment is in the morning on a cleansed, empty stomach. That’s when it is the most effective. So, you can prepare the smoothie the previous night and store it in the refrigerator. Have this chilled and healthy drink in the morning around an hour before you eat anything else. It might also be followed immediately with a laxative like castor oil (cold pressed and food grade). Many do not like castor oil and need a citrus juice to wash down the taste in the mouth. How Many Papaya Seeds Should You Eat? Does this mean you can simply grab a few tablespoons of papaya seeds and munch away or have them in a smoothie like described above? Well, the seeds are perfectly safe to eat, but the bitter and peppery taste might be overwhelming to start with. Maybe you can start with chewing one or two seeds. Then, work your way up to a tablespoon full, which will be sufficient for the smoothie recipe; ideally, have this for three to four days in a row. The research and studies on papaya seeds and their medicinal use have determined that the seeds have more value than the flesh of the fruit. The seeds also have antibacterial properties and are effective against E. coli, Salmonella, and Staphylococcus infections as well. It is also known to be a cure for piles and as a medicine against typhoid caused by Salmonella species. The antibacterial properties of these seeds also make them effective as a medicine against urogenital disorders such as trichomoniasis as they seem to help curb the toxicity levels. The seed shows bacteriostatic activity against Gram-positive as well as negative organisms and is useful in treating chronic skin ulcers. More study is required to be able to identify the other medicinal properties of this supposed wonder seed. It is actually a super seed and, irrespective of the age of the fruit, the seed gets a good score on its medicinal value and has the potential to cure a number of ailments. Some research indicates that papaya seeds are used to kill parasites in the intestine. However, a study conducted by the team at the National University of Singapore showed that the toxicity levels of papaya seeds required to kill parasites in humans may also damage our intestine and its functions. However, the chloroform-based extract of papaya seeds does show some hope. It was used in a study conducted in Mexico to show the antiprotozoal activity of these seeds on T. cruzi in mice. But more research is required in this area. Chances are that papaya is not available where you live, or it’s expensive and is not a regular affair. In that case, are there any other natural remedies for a parasite cleanse? Thankfully, nature does take care of it for us. Black walnut is known to be anti-parasitic: Recommended dosage 250 mg thrice a day. Wormwood: Recommended dosage 200 mg thrice a day. Oregano oil: Recommended dosage 500 mg four times daily. Grapefruit seed extract: Dosage as per the direction by your physician. Clove oil: Recommended dosage 500 mg four times daily. It can also be consumed along with tea. Be it a three-month routine or whenever needed, this simple recipe to cleanse parasites could be really helpful for most people. However, we do suggest you investigate the stool for a parasite presence in the lab. Also, we recommend consulting your doctor before you consume papaya seeds in any form, although they seem reasonably safe if consumed in moderation. Papaya seeds for parasite removal have been largely used in traditional medicine and they may be used in modern medicines in the future to treat such ailments. However, more research and evidence is required before they are used by pharma companies as they have to abide by stringent laws and regulation and gather enough supporting evidence. 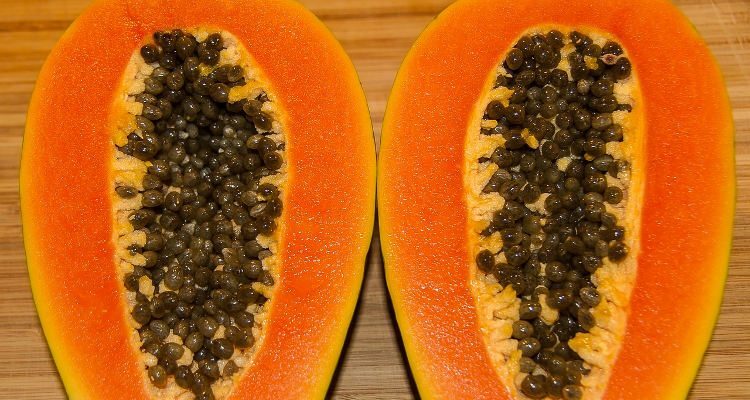 “How to Use Papaya Seeds for Parasites”; http://superfoodprofiles.com/papaya-seeds-parasites, last accessed February 1, 2018. Okeniyi JA et al, “Effectiveness of dried Carica papaya seeds against human intestinal parasitosis: a pilot study.” March 10, 2007; https://www.ncbi.nlm.nih.gov/pubmed/17472487, last accessed February 1, 2018. Neil, “Using Papaya Seeds to Combat Parasites”; http://www.fitclarity.com/using-papaya-seeds-to-combat-parasites/, last accessed February 1, 2018. “Wikihow to eat papaya seeds”; http://www.wikihow.com/Eat-Papaya-Seeds, last accessed February 1, 2018. “The Parasite Cleanse and Diet”; https://draxe.com/parasite-cleanse-top-5-treatments-naturally-2/, last accessed February 1, 2018. “Modulation of jejunal contractions by extract of Carica papaya L. seeds.”, https://www.ncbi.nlm.nih.gov/pubmed/16161026, last accessed February 1, 2018. “In Vivo Antiprotozoal Activity of the Chloroform Extract from Carica papaya Seeds against Amastigote Stage of Trypanosoma cruzi during Indeterminate and Chronic Phase of Infection”, https://www.ncbi.nlm.nih.gov/pmc/articles/PMC4172937/#, last accessed February 1, 2018.